The World Needs A Stronger Blog...: Bootleg Purse Parties? Where Do I Sign Up? Bootleg Purse Parties? Where Do I Sign Up? I thought all the great pirate's booty was exclusive to the murky world of the Canal Street kiosks but apparently there are suburban purse-parties! It's like a Tupperware party with wine, hors d'oeuvres and gossip except with fake handbags and watches for sale! Um, where do I sign up? “Purse-party ladies are the drug dealers of the counterfeit trade: they buy from the wholesalers and sell to suburban users, folks with a craving for the goods but not enough dough for the real thing. Like teenagers gathering at a friend's upper-middle-class home to buy a couple of joints with their allowance or babysitting money, suburban women converge in well appointed rooms for wine, hors d'oeuvres, gossip, and fake Vuitton or Gucci handbags. The women hosting these fetes will make a killing—they double their investment—and never declare it to the IRS. Take Virginia Topper, the wife of a lawyer in Long Island, New York. When she was busted in 2003, she had $60,000 in cash stashed in her underwear drawer and a Jaguar in the driveway. She was found guilty and sentenced to community service. "She was the ultimate Amway lady," [New York security expert Andrew] Oberfeldt laughed. Most purse party ladies don't see buying or selling fake handbags as a real crime.... In a survey by the Anti-Counterfeiting Group, one-third of those questioned said they would knowingly buy counterfeit goods if the price and quality were right, and 29 percent said they saw no harm in the selling of fake goods unless the purchaser was at risk. "We'll go on raids in Chinatown wholesalers and we'll find five or six suburban women standing there—customers," Oberfeldt tells me. "We'll say to these women, 'The dealers take you down dark corridors, through locked doors. The police say, "Open up!" The lights are turned out, and everyone is told to be quiet. At what point did you realize something was amiss here?'" Like the drug business, counterfeiting has become a professional racket run by organized crime. In New York in the 1980's until the mid-1990's, gangs—like a group of Asian American kids called the Born to Kill Gang—were in charge. "If we showed up to do a raid, women would take counterfeit watches, shove them up their shirts, and say, 'I'm pregnant, don't touch me!'" remembers Oberfeldt. "Once I saw a three month-old baby in a milk crate that sat on top of a case of M-80 explosives. The gangs came after us with bats, they'd slash our tires, throw knives and significant explosives. It was terrorism. They tried to intimidate us. We videotaped them and locked them up and we got a lot of street cred when we manned up from ten to forty men and kept going." “Deluxe” is great. Dana Thomas is Newsweek's fashionista and culture writer in Paris and she's the Paris correspondent for the Australian Harper’s Bazaar. Her book is about how the luxury market went mass market. 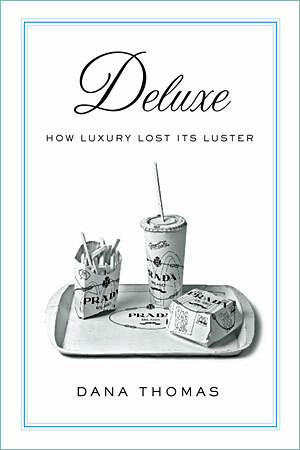 Thomas protests the modern luxury industry is a sham because its offerings in no way merit it's exorbitant price tags. HOLLA! Thomas says the modern luxury industry is a sham because its offerings in no way merit the high price tags they command. Yet once upon a time, they most certainly did. In the 19th and early 20th centuries, when many of luxury’s founding fathers first set up shop, paying more money meant getting something truly exceptional. All that changed, however, in the last decades of the 20th century, when a new breed of luxury purveyor, epitomized by Bernard Arnault, now the chairman and chief executive of the multibillion-dollar LVMH Moët Hennessy Louis Vuitton conglomerate, first came on the scene.